Hoppe cremonese window handle Monte Carlo series. You need the mechanism to install it. Mechanisms available here. 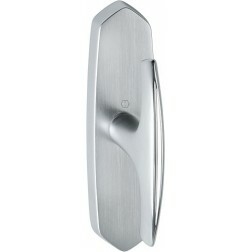 The hoppe cremonese window handle Monte Carlo series is robust, thanks to solid brass construction. The two-tone finish is a perfect "habit" for this handle. Matte and polished effect creates a nice harmony between them pleasing to the eye. The surface of Monte Carlo series is protected from erosion, spending time and dirt especially.